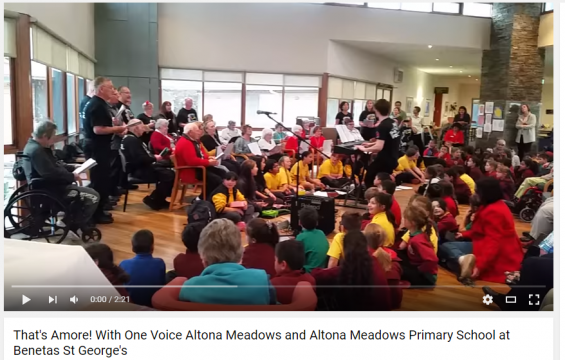 Hey everyone check out the Altona Meadows Sing for Good entry. 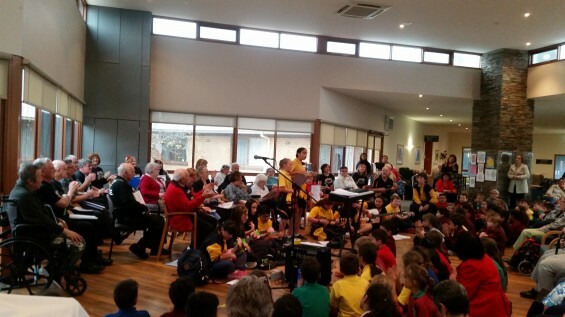 Last week Benetas St George’s hosted An Afternoon of Dean Martin, a collaboration of students from Altona Meadows Primary School and the members of With One Voice Altona Meadows. 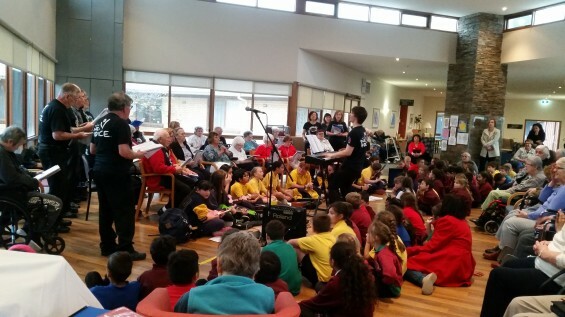 Conducted by With One Voice lead conductor Kym Dillon, the With One Voice Altona Meadows group includes residents of Benetas St George’s Aged Care Facility as well as friends, family and community members. 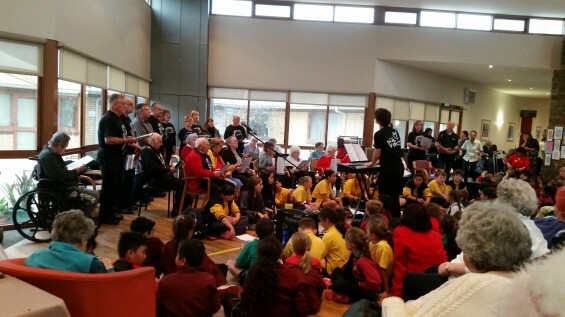 Over several weeks the students of Altona Meadows Primary, lead by Gregory Hall, visited the facility to rehearse with the choir. The students incorporated their musical instrument skills into the songs, and the two groups learned to sing in harmony. Age proved no boundary, as the two groups delivered a stellar performance to a jubilant crowd at Benetas St George’s on Wednesday. Many thanks to Altona Meadows Primary School, and Benetas for hosting. 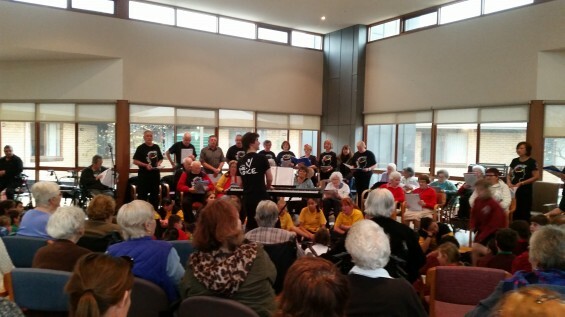 We look forward to more songs and laughter from Altona Meadows! All are welcome, join With One Voice today. The With One Voice choir season has officially begun! Was your New Year’s resolution to get involved in your local community? Was it to express yourself more or to give yourself a chance to sing again? Perhaps it was to make new friends, or reach out to those in need? Our doors are open and we welcome you to join us at your local With One Voice choir! Head to our Join A Choir page for all the necessary info. We started the year off on a great note, with members from around Victoria singing together in the Melbourne CBD for Australia Day. 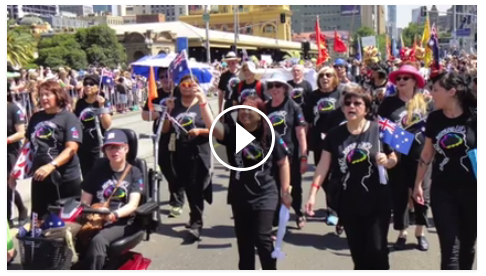 Click below to watch With One Voice participating in the 2016 Australia Day Parade. You sang, you spread the word and raised your voice for people experiencing depression,anxiety, loneliness, disadvantage, unemployment or homelessness. Together, through the magic of Sing for Good, more than $70,000 was raised for Creativity Australia’s  life changing With One Voice program. Relive the magic of Sing for Good 2015 by watching the highlight video below. Or (If you are feeling inspired) Register your interest for the 2016 campaign here. You can also see the full list of 2015 Sing for Good winners here. Do good. Feel good. Sing for Good is now open! Please help us get communities singing in every postcode of Australia! There are heaps of categories, plus cash prizes for schools. 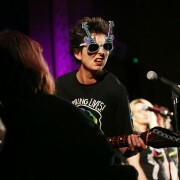 Winners are announced at our huge With One BIG Voice concert at Melbourne Town Hall (3pm Sunday 8 November). Book tickets. 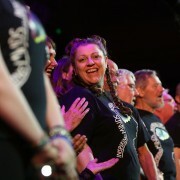 Do you want to start a community choir? Or re-energise an existing choir? You are warmly invited to be part of Creativity Australia’s With One Voice network. Depending on your needs, we can offer quick tips for success, a suite of resources and/or ongoing consultation. Download the MyChoir quick start guide. Here are the key things you will need to build a successful choir. Our MyChoir resources will guide you step-by-step! Download the MyChoir quick start guide or contact us to find out more. 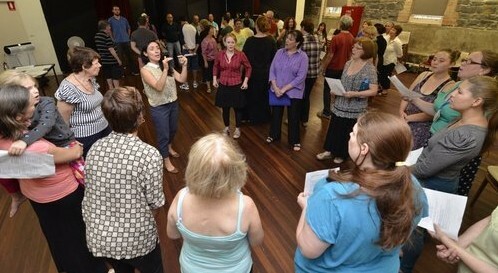 With One Voice choir rehearsals start THIS WEEK (save for Altona Meadows, which starts on 11 February)! Please check your choir rehearsal time and venue on this website for any changes and spread the word far and wide. Everyone is welcome! The With One Voice choirs are enjoying their final rehearsals and festive soirees for 2014 this week. All choirs return in the first week of February. ‘Til then, keep on sharing the joy of song and don’t miss our performance in Melbourne’s Australia Day Parade! Thank you to everyone in the choir community for your songs, smiles and support this year. We look forward to more musical adventures in 2015. Warm wishes to you and yours for a happy and harmonious festive season. A BIG congratulations to everyone who took part in yesterday’s concert. With One BIG Voice is a mammoth effort for all choirs, conductors and volunteers… and despite the inevitable hitch here and there our team went home exhausted, but smiling! Special thanks must be extended to our extraordinary conductors Shaun, Kym, Jane and Pippa and to our numerous volunteer choir secretaries, ambassadors and member support officers, who provide invaluable leadership support to their choirs every week. 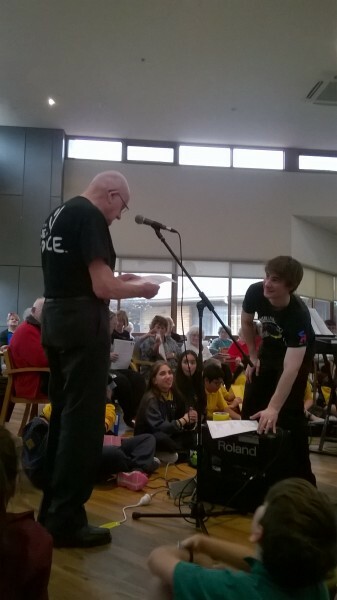 Yesterday, we also had the assistance of some very special concert volunteers. Thank you so much for all your efforts. Without you, none of this would be possible. Stay tuned for photos, videos and the announcement of the Top Ticket Sellers! The With One BIG Voice concert is this Sunday and WE’RE EXCITED! Please read this slightly updated Choir Schedule/Information Sheet to refresh your memory of the day’s events. Please note that individual choir rehearsals will now take place before the combined songs. Your smiles, patience and enthusiasm are sure to make With One BIG Voice a great success. See you at 10.45am on Sunday! Are You Coming This Saturday? 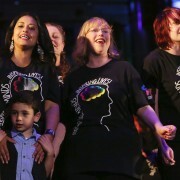 Please join us at Federation Square for the Big Community Sing this weekend! With One Voice Ashburton is in the lead, having raised $2,703.64! Please donate and vote now to support your favourites. Winners will be announced at the With One BIG Voice Concert by The Hon. Ted Baillieu MLA. Our big concert is fast approaching! Please ensure you have invited your friends, family and colleagues to book tickets. Some tickets will be available at the door.